WTI crude oil prices today (Tuesday) jumped 1.6% as production issues persist in Libya and Brazil. At 10 a.m., WTI crude oil prices traded at $46.89 a barrel. 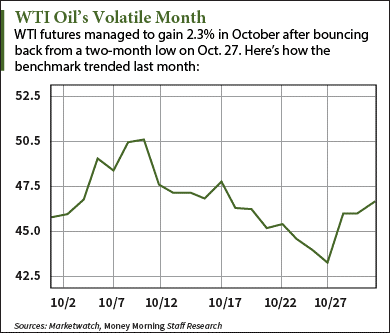 The U.S. benchmark leaped 2.3% in October despite hitting a two-month low of $43.20 on Oct. 27. Prices are now down 21.1% in 2015. Brent crude oil prices saw the same gains this morning. The global benchmark ticked up 1.6% to $49.55 a barrel. Futures gained 1% in October and are down 24.3% so far this year. The rise in WTI crude oil prices today came on news of production problems in major Libyan and Brazilian oil regions. This morning, Bloomberg reported Libya indefinitely halted crude oil shipments from its major Zueitina port amid conflict between the country's rival administrations. The ongoing unrest limited Libya's daily production capacity to 432,000 barrels a day in October. That's far below the 1.5 million barrel average. Additionally, Brazil's largest oil sector union – Oil Workers Federation – began a strike on Sunday against Petrobras SA (NYSE ADR: PBR). The union is protesting the company's plans to cut more than $15 billion in costs by laying off thousands of workers. The limited workforce at Brazil's largest oil corporation has temporarily caused a nationwide supply shortage. Despite shortages overseas, investors worry the growing U.S. supply glut will send prices lower over the long term. According to the U.S. Energy Information Administration (EIA), U.S. inventories increased by 3.4 million barrels during the week ended Oct. 23. That puts total U.S. supply at an 80-year high of 480 million barrels. But Money Morning Global Energy Strategist Dr. Kent Moors says you can make money in the energy sector no matter where oil prices move.